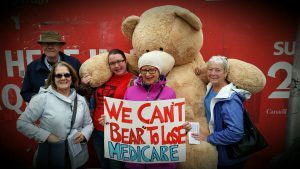 A giant teddy bear is helping to raise awareness about the threat of health-care privatization in the region with the slogan: “We Can’t Bear to Lose Medicare.” Natalie Mehra, executive director of the Ontario Health Coalition, and Jules Tupker, co-chair of the Thunder Bay Health Coalition, along with the seven-foot tall plush bruin, were outside the Civic Centre here late Friday afternoon. “Canada’s public health-care system is under threat by private, profit-seeking clinics that want to be able to bill OHIP for tests and surgeries and bill patients hundreds or even thousands of dollars, as well,” said Mehra. “User fees for medically-needed hospital and physician care are unlawful under theCanada Health Act,” she added. “We are drawing attention to this, explaining to patients their rights, and pushing back against the takeover of non-profit and public hospitals by private for-profit corporations,” Mehra noted. Both Mehra and Tupker noted private, for-profit clinics are pushing to privatize services from local public hospitals. And while Ontario has held out against the wholesale privatization of diagnostics and surgeries, privatization has been “creeping in around the edges,” particularly in larger urban centres. Mehra said the province is cutting services from local public hospitals and then handing them to private, for-profit clinics. Those clinics, in turn, often bill OHIP and bill patients on top of that. Hospitals, for instance, have been told to close their out-patient laboratories.So if a patient needs blood work done, they have to go to a private clinic. “Our job is to protect public Medocare,” Mehra stressed. ”There’s less services being provided for people, and the clinics charge user fees for things that were formerly covered by OHIP. “It brings in inequity,” she argued. ”The idea of public health-care is that everyone has access to health care, no matter how wealthy you are. “It’s understood as a human right, and when you bring in private clinics, they bill OHIP and they bill patients on top of that. this part of the province yet. But in a place such as Toronto, it&#39;s routine for patients to be charged $2,000 or more for cataract surgery. “These are seniors on fixed incomes being charged and the doctor is billing OHIP, as well,” Mehra said. “It’s a seven-minute surgery and they get to bill [OHIP] for more than $550,” she added. Tupker noted many people point out to the health coalition members that there already is privatization present in health care. And while that true, he added the coalition wants to halt it from spreading any further. “We’d like to reverse it but that’s going to be hard to do,” he conceded. Privatization is even more prevalent in other provinces, including Quebec and B.C. In B.C., for instance, private clinics even have launched a court challenge to brings down the laws that protect patients from user fees, maximizing their profits by billing the public health system and their patients, said Mehra. The Ontario Health Coalition is raising funds to help the B.C. Health Coalition intervene in the legal challenge, which could threaten public health-care across Canada. The stop in Fort Frances was the second on their Northwestern Ontario tour, which kicked off earlier Friday in Atikokan. The tour continued through Monday, with stops in Kenora, Dryden, Sioux Lookout, Nipigon, Terrace Bay, and Marathon.